The Earth's magnetosphere is an encompassing magnetic field that protects the Earth from harmful radiation and charged particles from the Sun and other sources. 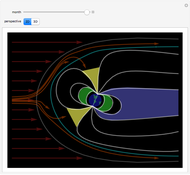 In the absence of other bodies, the magnetosphere would be radially symmetrical, but the solar wind distorts it drastically. This dragging effect allows radiation to penetrate but also explains events like the northern and southern lights. 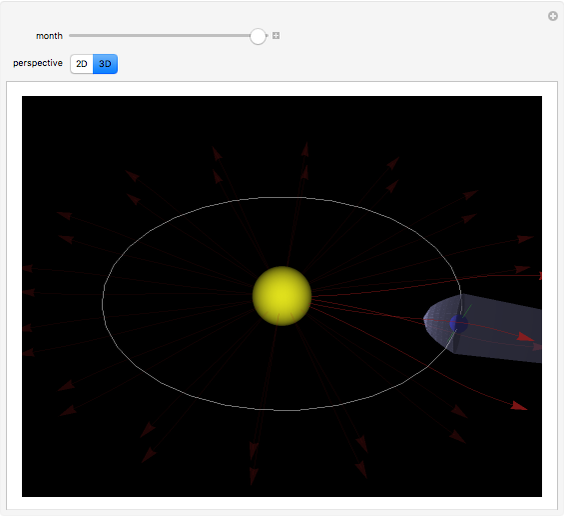 Use the slider to see how the magnetosphere changes depending on the Earth's position with respect to the Sun (the Demonstration is always initialized with the Earth's current orientation). Check out the three-dimensional perspective for a wider scope. 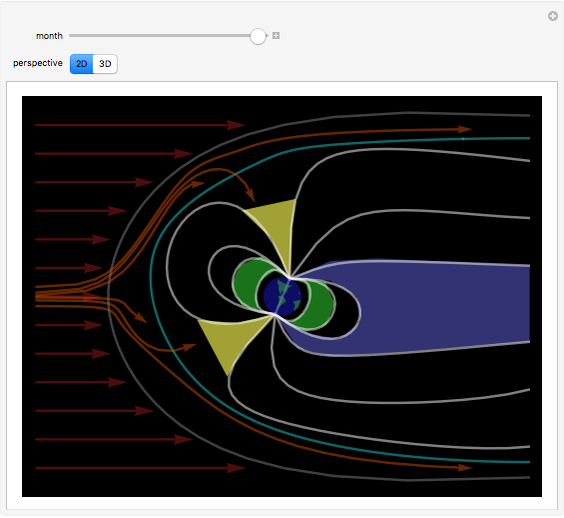 The shape of Earth's magnetosphere depends on only two factors: the magnetic field of the Earth and the solar wind, which is the pressure exerted by charged particles from the Sun, shown as the red arrows. The bow shock, shown as the gray region that looks like a sideways parabola, is the boundary where most of the solar wind is deflected around the Earth. Inside this lies the magnetopause, shown by the light blue curve, which is the border where the pressure exerted by Earth's magnetic field equals the pressure exerted by the solar wind. The region between this and the bow shock is known as the magnetosheath. The darker blue section in the shadow of the Earth is called the magnetotail. It stretches far into space behind the Earth (several hundred Earth radii). A useful analogy is to think of the Earth as a boat and the solar wind as a river. In that case, the magnetotail can be thought of as the wake created by the Earth. The green region that appears on either side of the Earth (in three dimensions it would wrap completely around the Earth to make one region) is the Van Allen radiation belt, a slim area dense with suspended charged particles. The loops near the Earth that do not trail off into the magnetotail are components of the plasmasphere. The yellow regions, called cusps, are gaps in the plasmasphere where charged particles can penetrate the Earth's magnetic field. The northern and southern lights are caused by charged particles that enter the Earth's atmosphere through these regions. The three-dimensional perspective is included to see how the Earth's titled axis of rotation and its orbit around the Sun combine to create the "wobble" effect of the Earth as seen in the two-dimensional perspective. 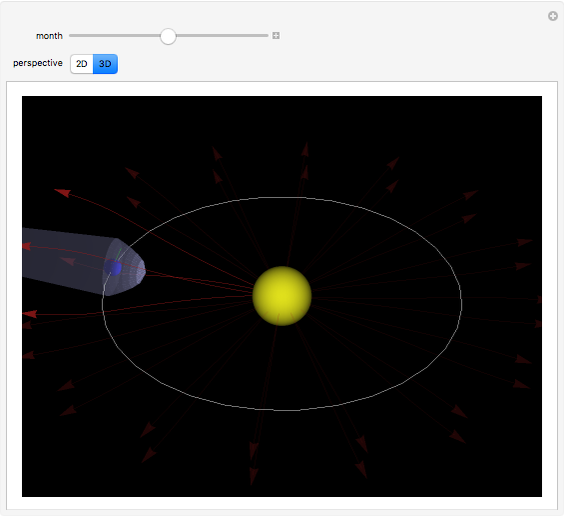 In reality the solar wind radiates in all directions, not just in the plane of Earth's orbit, but that is excluded in the diagram for simpler visualization. Just as the solar wind causes the magnetosphere to distort, the magnetosphere in turn deflects much of the solar wind around the Earth. Mark Peterson "Earth's Magnetosphere and the Solar Wind"